Several of the prisoners were seen seated in the yard of the Georgetown Prison. 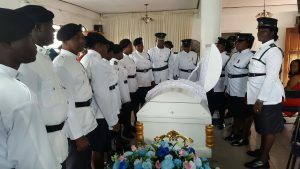 Even as Guyana Prison Service wardens were Tuesday preparing to bid farewell to Prison Officer, Odinga Wain Wickham who was killed during the violent unrest at the Camp Street jail earlier this month, their colleagues and other members of the security forces were busy quelling another disturbance by several inmates. 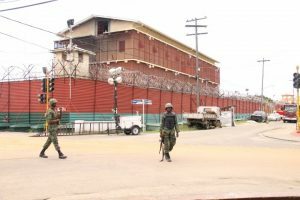 Fire fighters arrived on the scene and soldiers armed with assault rifles took up positions around the Georgetown Prison’s ‘brick’ building to which 86 ‘real bad’ prisoners were transferred Monday from the Lusignan swampy area. 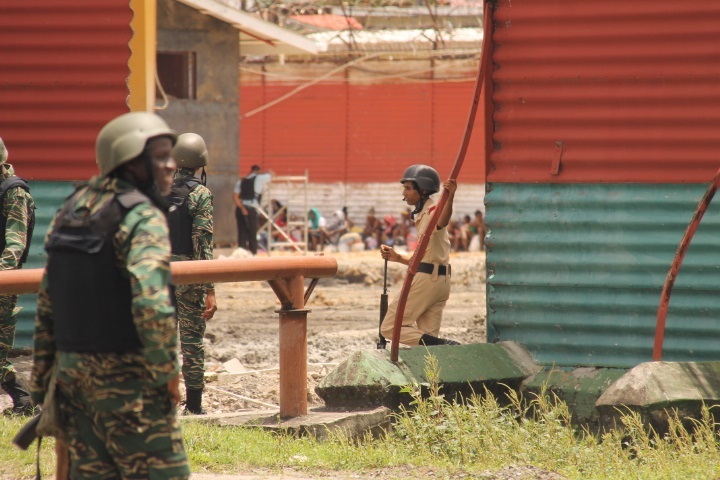 When Demerara Waves Online News arrived on the scene, several inmates were seen in the prison yard under heavy guard. It was unclear why they were outside. Sources said the prisoners complained that the brick prison was too hot. They also reportedly broke up beds, banged the doors and broke parts of the brick prison’s wall. Soldiers guard outside the ‘brick prison’ at the Georgetown Prison, Camp Street. No fires were lit, but at least three fire tenders were seen on Camp Street, D’urban and John Street. Hoses were already connected to water sources and fire fighters held them at the ready. The more than 80 prisoners were moved out of the swampy area at Lusignan after 13 of them dug a hole under the foundation of the more than 10-foot tall wall and exited the penal facility. By early Monday night, security forces captured seven of them at Mon Repos, East Coast Demerara and in several parts of Georgetown. In all, 10 escapees- the remaining four from the July 9 escape from the Georgetown Prison- and six from the Lusignan swampy area. Prison Officers stand solemnly next to the body of their fallen colleague, Odinga Wain Wickham. He was shot dead on July 9, 2017 during the violent prison unrest that also resulted in several of his colleagues and prisoners being injured. The Georgetown Prison was also burnt down. Public Security Minister, Khemraj Ramjattan has said the New Amsterdam and Mazaruni Prisons are “saturated” and so authorities had decided to keep the “real bad” ones at the swampy area until rehabilitation of the brick prison and the construction of associated facilities such as the infirmary, kitchen and administrative building were completed over the next few weeks. However, all that has changed and following the escape of the 13 from the Lusignan swamp, the others were moved to the brick prison on Camp Street. 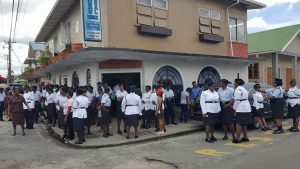 Less than a quarter mile away at Lyken Funeral Parlour at John and Bent Streets, family members, relatives and colleague prison guards of Odinga Wain Wickham were paying their final respects to him. Many prison guards, dressed in their ceremonial tunics, wept as the filed passed the coffin. While Wickham’s mother retained her composure, his aunt wailed uncontrollably and banged the coffin several times. She was moved away and restrained from getting back close to the coffin by several persons who sat on her and held her hands. Prison Officers and other mourners outside Lyken Funeral Parlour where Odinga Wain Wickham’s body was available for public viewing. The Guyana government has provided GYD$1 million to the deceased, an amount that dates back to 10 years ago at the height of the violent crime spree in which several policemen had been gunned down. That period of violence by heavily armed gangs dated back to February, 2002 when five prisoners shot and stabbed prison guards before bolting from the Camp Street jail. Soon after, that gang had spawned into a much larger number , all of whom had been ensconced in the East Coast Demerara village of Buxton from where they had staged kidnaps, murders and robberies.